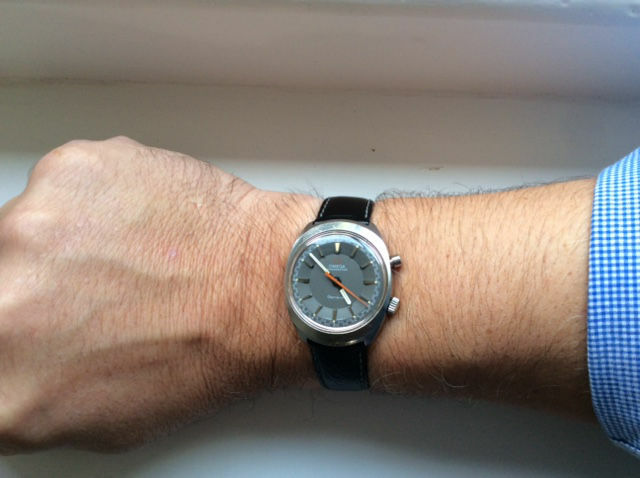 “My interest in watches and, in particular, the Omega brand stemmed from a beautiful silver 1970’s automatic Omega that I was left by by grandfather in his will. It needed some love and attention and I had the watch serviced and the glass replaced but once restored it was a classic, reliable and stylish timepiece. As a 20 year old young man the Omega consigned my incumbent Swatch to the bedside cabinet never to be seen again. As a young lawyer I blew my Christmas bonus on a Seamaster diver’s watch – the ubiquitous James Bond watch, very effectively marketed by Pierce Brosnan. My love of the Omega brand was sealed. I stumbled across Black Bough on a visit to see an old school friend in Ludlow. The vintage watches on sale resonated with me as they are expertly hand picked, lovingly restored and represent the antithesis of some of the modern marque watches that I find largely gaudy and bling. Instead, these watches are understated, chic and undeniably cool. I don’t consider myself a collector but I have 4 young sons and decided that each should inherit a quality watch. I have therefore bought 4 watches from Black Bough. Each have charm and style in abundance but my favourite is an Omega Chronostop that dates from 1969 (around the time I was born). It has an unusual Chronograph movement that allows the orange hand to time events or simply be used as a seconds hand. It has a grey dial and elegant yet sporty look. It has received a number of admiring glances, especially from one of my Parisienne Partners who has remarked on it a number of times (which I view as a hallmark of good taste!). As well as being aesthetically pleasing it keeps perfect time.